The exciting and dynamic nature of today's sport industry has sparked career interest from an ever-growing number of students. To meet the demand for quality sport management education, "Foundations of Sport Management" is designed to offer undergraduate students a stimulating introductory view of the skills and information necessary for a career in the sport industry. Topics covered are designed to reflect the core competencies recommended by the Sport Management Program Review Council and to equip students with the skills needed for a career in the sport industry. 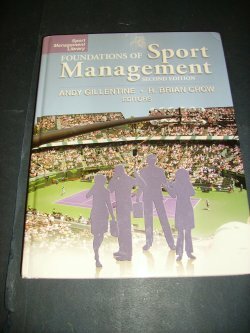 Each chapter introduces the theoretical foundations and practical applications for critical elements of sport management. Educators will appreciate the text's format, which is designed to allow for a smooth week-to-week transition of classroom instruction. The authors, who have all been identified as the current leaders in their disciplines, have provided case studies, chapter summaries, questions, and industry examples to supplement each chapter and to assist the student in gaining a comprehensive picture of the sport industry. 326pp. N.B. Corners of boards slightly bumped and slight bump to back edge rear board.